In this part of the website you'll find lots of rare archive material related to tours and concerts by the Barber Band over its fifty-year history -- programmes, posters, flyers, and so on. You can also view tour programmes on Andreas Wandfluh's website. The 1954-1994 Reunion Tour: Souvenir booklet and concert programme. This is a nicely illustrated 32-page booklet with numerous photographs in colour and black-&-white, and with text in both English and German. Publicity leaflet from the Reunion Tour of 1994. Here's one for our Danish friends: Programme from the 1994 reunion tour, featuring the original 1954 Chris Barber's Jazz Band and the then-current Chris Barber Jazz and Blues Band. The programme includes several photographs from the band's visit to Copenhagen in 1954. Another Danish item, this one a programme from a 1997 concert of the Chris Barber Jazz & Blues Band plus symphony orchestra. Programme from the Down Under 2000 Tour with Kenny Ball's Jazzmen. Ray Green of New Zealand has written a short article about the Down Under 2000 Tour. Pamphlet from a concert by the Big Chris Barber Band in Chichester Cathedral, July 11, 2002. VIPs of Jazz concert poster, 2002. 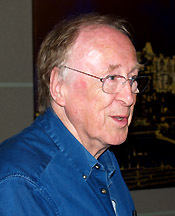 In 2000 and 2002 Chris Barber travelled to Vancouver, British Columbia, Canada, to perform and record with the Vancouver band Sweet Papa Lowdown. These sessions culminated in the excellent CD, One Of Your Smiles. On this page Jeff Shucard, leader of Sweet Papa Lowdown, tells how the collaboration came about. 50th anniversary tour concert poster. 50th Anniversary Tour Concert Review ~ The Anvil, Basingstoke, June 11, 2003, by Julian Purser. Ball, Barber and Bilk concert poster, 2003. 50th Anniversary Tour Concert Review ~ Swindon and Yeovil, February 23 & 24, 2004, by Julian Purser. Van Morrison concerts, April and May 2004: Photographs and text by Julian Purser. Programme from the Lonnie Donegan Tribute Concert, 2004. Julian Purser reports on the Lonnie Donegan Tribute Concert at the Royal Albert Hall, London, on Monday 21 June, 2004. The Water Rats Ball, November 2004. Orwell Park School, Nr. Ipswich, Suffolk, U.K. 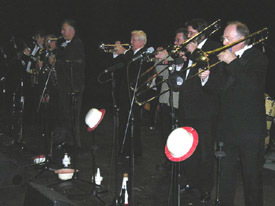 The Big Chris Barber Band in Denmark, January 2005: Andreas Wandfluh's account of his eventful trip to Denmark to see the band perform with Sjællands Symfoniorkester. Chris Barber's 75th Birthday Concert, Liverpool, 6 July 2005, featuring Van Morrison, Andy Fairweather Low, Bill Wyman, and "Big Bill" Morganfield. Two photographs of Andy Fairweather-Low on tour with the Big Chris Barber Band, December 2005. THE BIG CHRIS BARBER BAND CLIMBS MOUNTAINS! A diary of the road crew battling snow and ice to get to the next gig, by Julian Purser. Chris was awarded the honorary degree of Doctor of Music by Durham University on 28 June 2006. Photo, article, and a short introduction by Chris about a New Orleans Jazz Parade in Covent Garden, June 2006. Miscellaneous tour and concert posters from the 1990s and 2000s. On Thursday 30th August, 2007, the Big Chris Barber Band filmed a live concert at Shepperton Studios. Click here to view a copy of Julian Purser's invitation to this exclusive event, plus a set of photographs provided by Ben Williams of Classic T Studio, the company which is re-issuing the band's recent CD, Can't Stop Now. Excerpt from the programme for the Gillingham Festival, at which Pat Halcox played his last concert before retiring. Following the departure of Pat Halcox and Tony Carter from the Band on 16 July 2008, their replacements were Peter Rudeforth on trumpet and vocals and Zoltan Sagi on reeds. Peter and Zoltan played their first date with the band on Wednesday 23 July in Macclesfield, and their second on Friday 25 July at the Queen's Hall, Edinburgh -- the band's concert to lead off the 2008 Edinburgh Jazz and Blues Festival. Two members of the Chris Barber website and archives team (Julian Purser and Ed Jackson) were in Edinburgh for the gig, and have updated the site and added new material to reflect the new personnel changes -- most notably a page entitled The Big Chris Barber Band in Edinburgh: Live at the 30th Edinburgh Jazz & Blues Festival, 25 July 2008. Andreas Wandfluh, who is one of the three members of the Barber website and archive team, is an avid collector of memorabilia about the band. Here are three of his most recent acquisitions, associated with performances in November 2008. Andreas Wandfluh attended two Barber concerts in Switzerland in early November. He has created two photo galleries from the hundreds of photos he took on those occasions. Click here to view Andreas's photo gallery from Aarberg. Andreas's second photo gallery comes from a concert in Schaan. Richard Exall: NOT with the Big Chris Barber Band -- a tongue-in-cheek pair of photos about one band member's activities when not on the road. On the 19th of January 2009, Chris unveiled a stone in the pavement in the centre of Enkhuizen - a real jazz town in the Netherlands - on the Jazz Walk of Fame. (March 4, 2009): Chris will soon be appearing on Rick Wakeman's Face To Face, a new television interview series due to be broadcast on television stations around the world and on the World Wide Web. Sennheiser donates microphones to the Big Chris Barber Band. Chris Barber's appearance on Rick Wakeman's new television series, Face To Face With Rick Wakeman, is now available for purchase download at RockOnDigital.com. Video and photos by Mike Henry. A page to commemorate Julian Purser, who was Chris Barber's archivist and discographer, and, from the beginning of 2004, one-third of the Chris Barber Website & Archives Team, which manages this site. 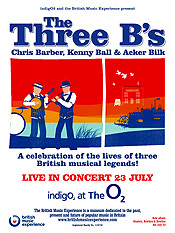 Chris Barber, Kenny Ball and Acker Bilk reunite for the first live performance in 10 years; Live at the indigO2 at the O2, July 23rd, 2009. Andreas Wandfluh writes about the three days he recently spent at the 25th annual JazzAscona Festival in Switzerland. 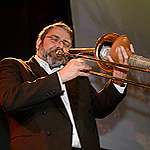 Mike Henry's photos from JazzAscona 2009. Using photographs taken by himself and Bas Meijer, Andreas Wandfluh has compiled an excellent gallery of close to 100 images of JazzAscona 2009. The pictures can be viewed in gallery format as well as in a slide show. 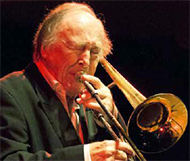 On June 20th, 2009 the Big Chris Barber Band flew in to Israel for a concert at the Caesarea Jazz Festival. Bas Meijer, light engineer of the Big Chris Barber Band, took very interesting pictures not only from the Jazz event, but also from a short trip to Jerusalem. John Crocker with the Ken Colyer Legacy Band, July 11, 2009. It is a PDF-file; adjust your settings to 150% and you can easily read the content. Woomy Schmidt, a German producer and TV presentator, has written an article on the occasion of Chris Barber's 80th birthday. This article was published by the German Jazz Magazine "Jazz Podium" in their May 2010 issue. We are happy to get Woomy Schmidt's permission as author to present this article as well as the pictures here on the website. This file is a large PDF file of 1 MB in size. 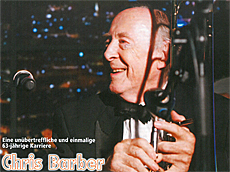 THE BIG CHRIS BARBER BAND: On the road in Germany and Holland, April 2011: A brief record as kept by Bob Hunt, on Facebook. 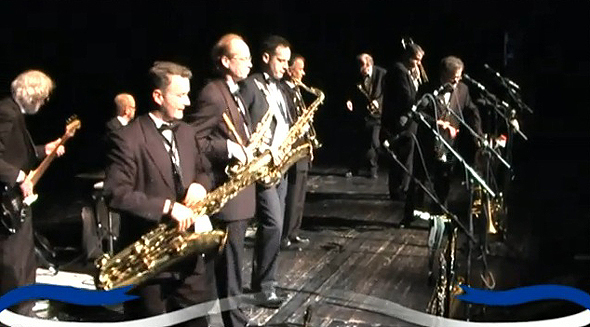 Bert Brandsma's videos of the Big Chris Barber Band. 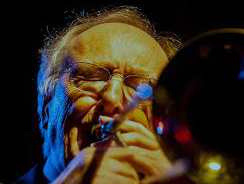 Woomy Schmidt wrote a fantastic article about Chris Barber at the occasion of his 85th birthday. Ria Wigt informed us that Woomy gave his permission to publish this article here on the Chris Barber website. We thank Woomy and Hans Kumpf (photo) for this. Please take note that this is a large file of 3 MB in size. 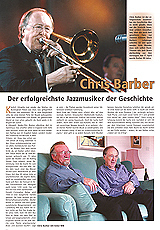 Prior to the concert on Sept 9th, 2016 the London Jazz News published a short interview with Chris Barber. We are very pleased to present Jason Whiton's special article about the British Music Experience, Liverpool. 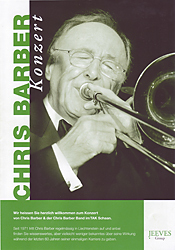 Chris Barber and his bands are regular guests at the British Grandprix. As early as 1964, the Chris Barber Jazz Band recorded the song "Brands Hatch", referring to the then world-famous F1 track. The following pictures by Mike Henry show the Big Chris Barber Band at the Silverstone Event on July 8, 2018. Thank you Mike for giving you permission to publish these fotos on this website. See the pictures here.